Large, messy construction jobs require proper tools, but even casual construction enthusiasts appreciate having specialized equipment on hand when the need arises. 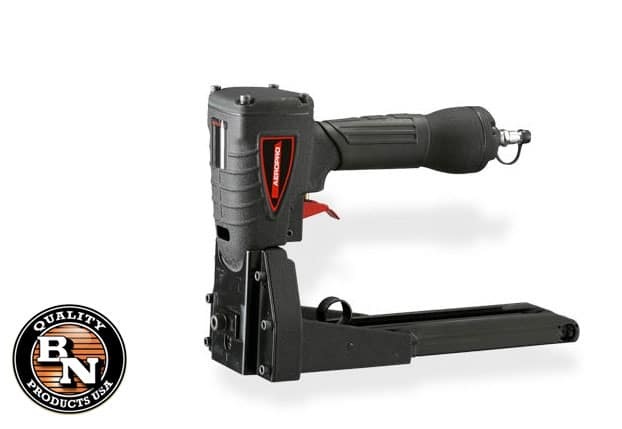 A reliable carton stapler that make quick work of securing corrugated boxes is a must-have tool in a variety of business and industrial settings. The MTA18 Carton Stapler offers a great option for any company that has a recurring need to package products for transport and delivery. It also is suitable for a variety of construction uses, and is finding a role for home-based business and DIY enthusiasts as well. Material packaging needs are diverse. Whether you package and ship small parts or large appliances, a heavy-duty carton can be difficult to seal properly. Securing materials to a pallet is another case where using a stapler is almost a requirement. In any warehouse setting, having a reliable, portable tool to meet your needs is vital. Our portable model will meet many of those needs. You may value “outside the box” thinking when it comes to developing new business strategies, but when you ship anything, it is an absolute necessity that what you pack inside that carton remains inside. The importance of sealing the contents securely cannot be overemphasized. The specialized tools you have on hand go a long way in protecting your investment, your employees and your bottom line. In today’s world, with the growth of home-based business and online commerce, an increasing number of contractor tools are also making their way into the home environment. A lightweight, easy-to-use carton stapler is one of the tools that you can bring home to meet the family — with full confidence that the meeting will go well. Budding entrepreneurs will find great value in a fast, efficient tool that can seal shipping cartons quickly and safely. Shippers, too, appreciate well-sealed cartons. The benefits extend well beyond your doorstep, ensuring that customers receive packages in good condition, filled with contents that they want and need. Another breed of home user, the DIY-er, will also appreciate a lightweight, adaptable stapler for projects as diverse as garden trellises and den upholstery. Designers who fabricate cornice boards, elaborate window treatments, or custom shelving and display cases can save time and headaches by using an air stapler in preference to a hammer and screwdriver. Carton staplers are just one of those tools that has a diverse array of uses. Construction contractors know how having a reliable stapler around is useful in a plethora of situations. Alongside air compressors, reliable nailers and sharp cutters, these tools will prove to be helpful for all types of DIY needs and projects!